The Ashi samurai where known for being reserved off the field and very skilled in combat on the field of battle. Legend states that they used "unorthodox" sword fighting techniques and moves. Thought to possess evil magic, the ashigaru (foot soldiers) would try to keep their distance from these samurai in battle. This fine authentic reproduction of traditional Japanese yokohagi Okegawa ni-mai dÃ´ samurai armor is hand made by the Fenglinhanjia Armory. Each suite of samurai armor can be ordered with the customary Gusto Bitsu (armor storage box) and a wooden stand for the display of the armor. Assembly instructions are also included. The armor is wearable and fully functional. The red hair is removable. Optional: Customary black lacquered box which, along with an included wooden frame, provides the support for the display and instructions. 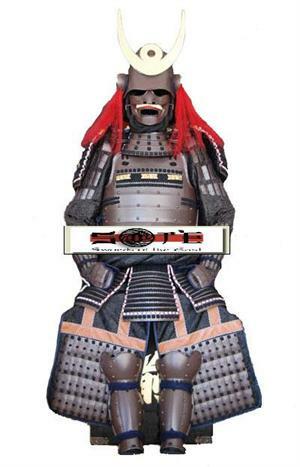 These saqmurai armor suits are all handmade, these life sized, fully functional and completely authentic reprocuction Japanese Samurai Armor and helmets are made with authentic methods and materials only. Every suit has been researched and made after private collection, museums or temples of the actual armor. Each piece of armor is made specifically for re-enactors and private collectors that demand authenticity, detail and quality of materials. Each of the Japanese suits of armor was only worn by the shogun, highest military class, samurai and emperors. Japanese samurai armor and samurai swords are powerful, unique works of art made by talented craftsmen. Each suit of Japanese armor (Kikou), Japanese Helmet (Kabuto) and Japanese Sword (Katana) truly has a soul or chi as well as a personality all of its own that makes it unique. These stunning works of Japanese art are made strictly in the authentic and traditional manner - all by hand and all by highly skilled craftsmen and are now made available for everyone at affordable prices. Our armor has been featured in dozens of movies, tv shows, museums, high profie clients homes, and dojos throughout the world. Japanese suits of armor are typically displayed in home, restaurant, corporate, cultural and museum locations. Japanese armor and Japanese swords are both excellent symbols of Japanese art, culture, and can be adapted to any interior situation and will really be a talking piece for your friends. Check the site often because We are always adding new Japanese armor pieces and Japanese Samurai swords to our site giving our clients the widest veriety of Japanese armor and Japanese swords of the highest quality at the lowest possable prices! Each Japanese samurai suit is a full sized, fully authentic reproduction of the original armor and comes with everything you see in the photo, which includes the black lacquered display / storage box and display stand holding the armor. These authentic reproductions are made of iron, steel, leather, silk, cotton, brass and other materials that were traditionaly used dorring the Sengoku era in Japan. Abosuletly no plastics, rubber, glue or synthetic material are ever used in the armor. Each armor is full sized, fully functional, combat ready and come pre-fitted for a person who stands between 5' 2" and 6' 3" tall with average body type. The armor can be easly adjusted for a better fit by the owner. We can sell the armor without the stand for a slight discount and shipping is included in these prices within the US. Some models are in stock and some are shipped forge direct which takes about 3 weeks. Please call 1-877-704-3600 or email sales@swordsoftheeast.com for availability.